Reading, Great Britain. Top table. left, Jurgen GROBLER and Paul THOMPSON. 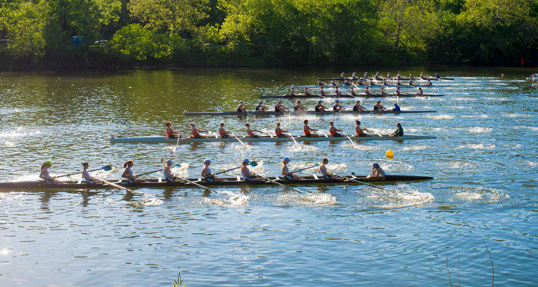 2011 GBRowing World Rowing Championship, Team Announcement. Photo by Peter Spurrier. Anyone who knows even one thing about Olympic rowing probably knows about Jürgen Grobler. And if not the man himself, they can name at least one of the athletes he’s coached—many of them legends in their own right, with Sir Steve Redgrave first and foremost on that list. You have to reach back almost 35 years to find an Olympics where Grobler’s crews didn’t strike gold, and that was because the boycott of Los Angeles 1984 meant that his East German rowers and those of several other Eastern Bloc nations didn’t even get to race. Moving past that blip, you have to keep turning back the clock another three Olympiads to arrive at an era before he started producing international champions. In short, the man is a living legend. As with all good legends, of course there is some mystery to the man, who has dominated the world of international rowing for so long. With every win, with each new champion produced, the inevitable question is asked anew: How does he do it? I hadn’t exactly been putting off contacting Grobler, far from it in fact. It was just the problem of a little ocean between us that prevented me from heading over to Henley for a face-to-face meeting. A phone call would have to do and we eventually made the necessary arrangements. In the meantime, I dove into some serious research to uncover what information was out there about Grobler. I wanted to know what questions have been asked already and look for some way to find new insight into a career spanning half a century. As I sifted through newspaper articles, book chapters, web pages, quotes, interviews, and memories about Grobler and the many rowers he’s trained, a picture of the man began to emerge. Here was a coach with a reputation for making ruthless selection decisions, yet cares deeply for his athletes. At worst, he has been portrayed as a pawn or even collaborator of the powerful East German Stasi (secret police), embroiled in acknowledged state-sponsored doping during his time in his home nation; at best as a man of conscience, expressing regret for the suffering of athletes, who, like him, were unable to change what they could not control in unimaginably difficult situations. The grim realities of an East German sporting policy that ensured systemic compliance through coercion and suspicion aside, one thing is certain, Grobler’s winning ways successfully transitioned with him when he took over the reins of the British team that has by all accounts remained clean throughout his tenure. As the phone rings, I’m still not sure how the conversation is going to go. To those that don’t know him, I have heard that Grobler can seem distant, impenetrable. The voice that answers is quiet and reassuring, his calm German accent lending precision rather than austerity to his English. After our introductions, we laugh about something small and I feel completely at ease. This ability, to be both approachable and insular as the situation demands, I would learn is one of Grobler’s strengths as a leader. “He is not one dimensional,” Mike Teti tells me when I ask him for his thoughts about Grobler’s methods as a former fellow Olympic coach, who has come to admire him and considers him a friend. “I think the thing that separates him is he is not just always serious,” says Teti. His first impression of Grobler was decidedly more social than most, as he found himself near the end of his own racing career in a championship eight at the Head of the Charles with an already famous Steve Redgrave and an-up-and-comer named Matt Pinsent among others with Grobler as coach. With the ice broken, our talk turns to rowing and I ask Grobler what he feels are the most important elements of an elite training environment, the things he couldn’t do without if all else were taken away. It is a good thing for Grobler, however, that athletes are in the picture since one of his great skills as a leader has been in managing people. This has allowed him to navigate the often-turbulent waters of high stakes and even higher emotions surrounding the difficult decisions that have ultimately led to his crews’ many successes. Grobler’s exceptional skill in this area has extended beyond the athletes. In his role as chief coach, his capacity to provide the needed feedback and support for the coaches on his team was something not lost on a young Martin McElroy, long before his most recent stint with the Canadians through to the Rio Olympics. McElroy, who entered Team GB’s coaching ranks in the late 1990s with an eight making the leap from under-23 success to the senior level, would help guide the British to their first Olympic win in the eight since 1912 at the 2000 Sydney Games. It was another 17 years until the British would win the men’s eight again, and in Rio it was under the direct coaching of Grobler himself. “I have always thought if the rower wins, it is his fault, and if he loses, it is the coach’s fault,” says Grobler, who has a profound respect for the work his athletes have put into the process of becoming the best in the world. There is a fine line, however, between sitting around, waiting for excellence to happen and making the hard decisions sometimes needed to ensure it. Grobler’s boating changes in the lead-up to major events—most infamously being accused of sacrificing the pair and eight in order to boat a winning men’s four for the Athens Olympics in 2004—are examples of a reality that can be frustrating for both athletes and coaches. Combined with the excellent training and technical ability of his rowers, Grobler’s uncanny ability to select the ‘best possible option’ when it comes time to form his crews has proven successful time and again and brought to the British team a reputation for tenacity, along with their dominance on the world stage. As our phone call nears its end, I can see strong elements of Grobler’s successful strategies in all that we’ve discussed: a focus on the basics of hard work and technical precision; acting professionally and considerately with his athletes; understanding that it takes time to develop into a champion. I can’t help thinking, however, that perhaps there is something else, some secret words of hard-won wisdom known only to him that he might not have wanted to share. But just as suddenly the answer is right there as Grobler once again begins to chuckle when I ask him about the future. Our good-byes said, I am once again alone on my side of the Atlantic to reflect on these final words. The intractable passion for a sport he fell in love with over half a century ago has sustained Grobler through all these years. His love for rowing remains as bright a light as ever to guide him into whatever the future holds in store. This I think, more than anything, might be the true secret to Grobler’s lasting success. Today, in historic fashion, the Princeton Tigers beat out the University of Pennsylvania and Columbia University to win the 2017 Child’s Cup for the 50th time in the annual events 107th iteration.